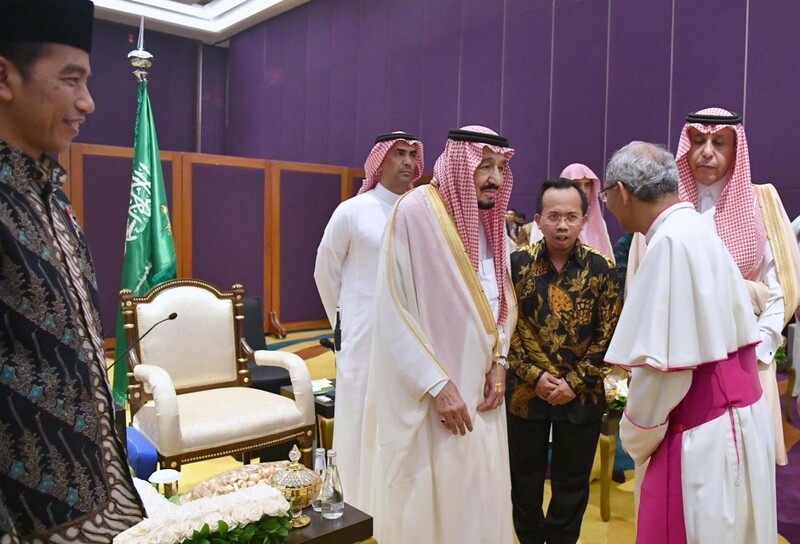 In a display of religious tolerance, 28 leaders of Indonesia’s major religions — Islam, Buddhism, Hinduism, Confucianism, Protestantism and Catholicism — took part in a dialogue with Saudi Arabia’s King Salman bin Abdulaziz Al Saud on Friday. In the closed-door meeting, which lasted about 30 minutes, the monarch praised Indonesia’s religious life and called on the leaders to embrace one another to ensure that the rights of every believer were upheld. “Stability in Indonesia is the fruit of the spirit of tolerance and coexistence among its people of all stripes. We should always offer hands among religious believers in order to strengthen the values of tolerance,” the king said as quoted by a press release issued by the State Palace. King Salman, who leads one of the most conservative nations in the world, highlighted the need for all religions to stand up for and protect the rights of their followers. 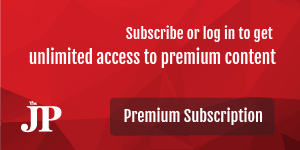 “Such a move is important to curb the influence of radicalism and extremism,” he said. The king’s statements could not be timelier for Indonesia, which has seen a spike in cases of intolerance in recent years and what many consider an alarming rise in sectarian sentiment. President Joko “Jokowi” Widodo’s administration seems to be using the visit of King Salman, known as “the guardian of Islam’s holy shrines”, to amplify the message of tolerance in the country. The President himself acted as the host at Friday’s interfaith forum, which began with the address of the king. “Your Majesty King Salman bin Abdul Aziz Al Saud, the religious leaders present here are the prestigious assets of Indonesia in contributing to peace in Indonesia and in the world,” Jokowi said. Islam was represented by nine scholars during the event, while there were four Protestant figures, four Buddhist representatives, four Hindu leaders, four Catholic scholars and three representatives of Confucianism. The octogenarian monarch was in Jakarta for a three-day state visit that began on Wednesday. Friday was his last day in the capital and he is scheduled to fly to Bali on Saturday for a holiday until March 9. On Thursday, he spoke before hundreds of lawmakers and high-profile figures at the House of Representatives to call for a united front to deal with what he termed “a clash of civilizations” and terrorism in order to maintain peace in the world. Later that day, he spoke to 38 Islamic clerics at the State Palace where he called on Islamic leaders in Indonesia to promote moderate Islam as a solution to fight terrorism and radicalism. Indonesian Communion of Churches (PGI) chairperson Rev. Henriette Lebang said the interfaith forum could reduce currently high sectarian tensions that emerged after a string of large scale rallies demanding the prosecution of Jakarta Governor Basuki “Ahok” Tjahaja Purnama for allegedly insulting the Quran. “This is the right moment to reinforce tolerance and peace and we appreciate the President’s initiative to invite religious leaders to attend the forum,” Henriette, who had the chance to speak with the king, said. “The king’s love of tolerance [shown] by being willing to meet and talk with leaders of various religions should serve as a lesson for Indonesians to always uphold unity regardless of their religion,” she said. Noted Islamic scholar Azyumardi Azra told the king during the forum that Indonesia and Saudi Arabia, as countries with Muslim-majority populations, had to be active in campaigning for peace in the world. He took the chance to encourage the king to work with Indonesia on introducing the latter’s concept of Islam Nusantara (Islam of the archipelago) to the Interfaith Dialogue Center that Saudi Arabia initiated in Vienna. “I also recommended that Saudi Arabia and Indonesia push for the establishment of a conducive situation as the actualization of Islam as rahmatan lil alamin [a blessing for the universe],” said Azyumardi. Foreign Minister Retno LP Marsudi said the religious leaders at the event represented Indonesia’s diversity. “Diversity is the asset of our diplomacy,” Retno said. Photos and video clips of President Joko “Jokowi” Widodo holding the hand of the Saudi king to help the octogenarian leader walk at the Bogor Presidential Palace and again on the stairs of the State Palace in Jakarta went viral on social media this week. It may have been an unintended outcome, but King Salman bin Abdulaziz Al Saud, whose visit to Indonesia dominated the news this past week, has lent a big hand in propping up Jokowi’s domestic public standing, particularly among Indonesian Muslims. The massive media publicity surrounding King Salman’s visit has helped replenish Jokowi’s Islamic credentials, often questioned by some conservative Muslim groups and his political opponents. Prior to the visit, the government and media had hyped the potential economic benefits Indonesia would receive by hosting the leader of the oil-rich kingdom, forgetting the fact that the Saudi economy has been hit by the consistently low world oil prices in recent years. Sure enough, those expectations were deflated when only US$1 billion was pledged from the 11 agreements signed by the two governments on Wednesday. In contrast, the Saudi king pledged $7 billion during his previous stop in neighboring Malaysia. The massive publicity garnered by the king’s Indonesian visit was due to the fact that he arrived with a delegation of 1,500 people, including 10 ministers and 25 princes, and their grandiloquent mode of travel: seven specifically designated planes. On Saturday, the group will travel to the Hindu island of Bali, Indonesia’s famous holiday destination, for a five-day vacation. President Jokowi broke state protocols for welcoming heads of state, greeting King Salman personally at the airport, rather than at the State Palace, and then taking him to Bogor rather than Jakarta. Clearly the king was no ordinary guest and he received as close to a royal treatment as the Indonesian President could have lavished upon him. Jokowi accompanied the king on a tour of the massive Bogor Palace gardens. When it poured with rain, he held the umbrella to keep his royal guest dry, which left him soaking wet. In Jakarta, Jokowi personally drove the golf cart to shuttle the king between the presidential and state palaces. Jokowi also made the visit somewhat personal. During lunch in Bogor, he turned on his smartphone to record his own statement and then got the king to make some remarks. The video clip was posted on Jokowi’s vlog and it immediately went viral. King Salman is the first Saudi king to visit Indonesia in 47 years. The last visit was made by king Faisal in 1969 during president Soeharto’s rein. Neither Soeharto, for the remainder of his reign until 1998, nor the four succeeding presidents — BJ Habibie, Abdurrahman Wahid, Megawati Soekarnoputri and Susilo Bambang Yudhoyono — were able to convince the Saudi monarch to make the trip to Indonesia again, in spite of it being the country with the largest Muslim population. President Jokowi may not have clinched any massive economic deals, but this did not stop him from boasting that he had secured from the Saudi king the restoration of Indonesia’s annual haj quota to 211,000 beginning from this year. The quota was slashed by 20 percent in 2014 because of ongoing renovation work at the Al Haram Mosque in Mecca. President Jokowi has come under a lot of pressure from some conservative Muslim groups and political opponents, who have repeatedly attacked and cast doubts about his Islamic credentials. This has been a recurring issue since his presidential bid in 2014, when during the election campaign his opponents accused him, falsely, of being a Christian, ethnically Chinese and a communist. Accusations of him being unIslamic resurfaced in October last year when he stood up for Basuki Tjahaja Purnama, who succeeded him as governor of Jakarta when he became president in 2014. The governor, a Christian of Chinese descent, is currently on trial on charges of blaspheming Islam. Ahok, as he is popularly called, is also running for reelection next month. In an apparent snub to his critics, Ahok greeted King Salman at the airport, in his capacity as Jakarta governor. Time will tell whether the Saudi king’s visit will have a real and long-standing impact on relations between the two countries, but as the popular saying goes, in politics, perception is everything. This is true in Asia, where face-to-face encounters are regarded as important in building relations, and Islamic tradition, where silaturrahmi, or a personal encounter, is highly encouraged and praised. The visit by the Saudi king after 47 years could herald a new start in relations between the two countries, one as the host and custodian of Islamic holy sites, and the other as the country with the largest Muslim population. In building ties with Saudi Arabia, Jokowi may have done something that no other Indonesian leader before him has. In the process, he may have also helped build his own credentials as the leader of the largest democracy among Muslim-majority countries in the world.